989 ND BOLIVIA (1987) Condor*. Tapir*. Vicuna*. Armadillo*. Spectacled bears*. Toucans*. Complete set of 6 imperforates. Wildlife conservation. Scott Nos 742-7, Yvert Nos 683-8. 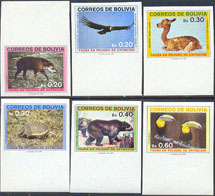 7025 ND BOLIVIA (1987) Condor*. Tapir*. Vicuna*. Armadillo*. Spectacled bears*. Toucans*. Complete set of 6 imperforates. Wildlife conservation. Scott Nos 742-7, Yvert Nos 683-8.